Yahoo News published a story this morning published online a story, "Forbes Photographs 'Titans of Philanthropy'" noting the group which represents $126 Billion dollars. How many of those photographed can you name? Honestly... I can name a few but not the entire group without help. My prayer for these people is that they give their money to good causes that genuinely promote the common good influenced by virtue. Agimus tibi gratias, omnipotens Deus, pro universis beneficiis tuis, qui vivis et regnas in saecula saeculorum. Fidelium animae, per misericordiam Dei, requiescant in pace. Amen. I am not a subscriber to Entertainment Weekly but this week when I saw the magazine I had another reason for not reading this rag. 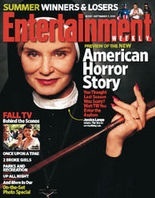 The well-known actress Jessica Lange is on the cover wearing a religious sister's habit, a crucifix around her neck, brandishing a cane and wearing fire-engine red lipstick and painted nails advocating "American Horror Story." Hmmm, the artists got the look of many women religious, right? 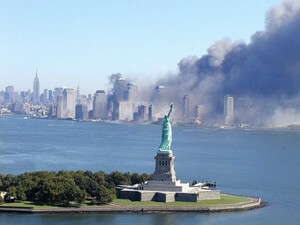 It doesn't take a brain surgeon to see the ugliness of this image viz. with conversation the Church is having with the Leadership Conference of Women Religious (LCWR). While I am not a fan of what the LCWR stands for, or perhaps more accurately, what some members of the LCWR stand for, there is no need perpetuate the crass cliché through mocking portrayals of ruler-wielding nuns who are seen as backwards and stupid. The vast majority of religious sisters and nuns are not this way. One ought to ask, "What about the beautiful work of teaching children Catechism, their work with the poor and the marginalized, all those women of prayer and learning in hospitals, and schools? I think EW has stooped way too low in publishing a cover with anti-Catholic stereotyping. One can't claim that some members of the media are not anti-Catholic when a prominent magazine puts silly things on the cover. Really, a terrifying nun to advance a fictional plot? What does one say when EW describes Sister Jude (Miss Lange's character) as a "scarily stern woman of faith...and a fan of corporal punishment...who has a penchant for red lingerie and vivid fantasies about her superior, Monsignor Timothy O'Hara." Further, EW quotes Joseph Fiennes who says, "Clearly she's attracted to the monsignor for his grace and religiousness." Fiennes plays O'Hara, "the monsignor might play with that, manipulate that." Slutty nun. Manipulative priest. The show's co-creator, Ryan Murphy says, "I'm scared of aliens and I'm scared of Nazis and I'm scared of nuns." To posit that there is no anti-Catholicism, I would think you might want to revise your opinion given the presence of fact: anti-Catholicism has a history, it's alive and well. Some Catholics are not bothered by dysfunctional nuns priests. Art, in this case, is claimed to be in the realm of opinion, that is, subjective. It is said that what is one person's good-natured ribbing is another person's offensive stereotype. Do we really think it is appropriate to hold this idea at all, never mind if we apply the whole issue to those who hold Judiasm or Islam as their faith? Would the media think that making fun of a rabbi, an iman or a Buddhist monk is a good thing? That doing so is good natured? Why do it to Catholics? EW's incredibly sad portrayal of a Catholic sister as the centerpiece of fictional show on TV is wrong, disrespectful, especially when the reality is very different. The concept is ill-conceived. This page is a archive of entries in the Culture category from September 2012. Culture: August 2012 is the previous archive. Culture: October 2012 is the next archive.